Rhiwbach and the Engine House chimney, seen on a stormy day, looking east from the Rhiwbach Tramway. 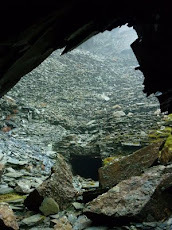 Slate quarries are often sited in awkward places. 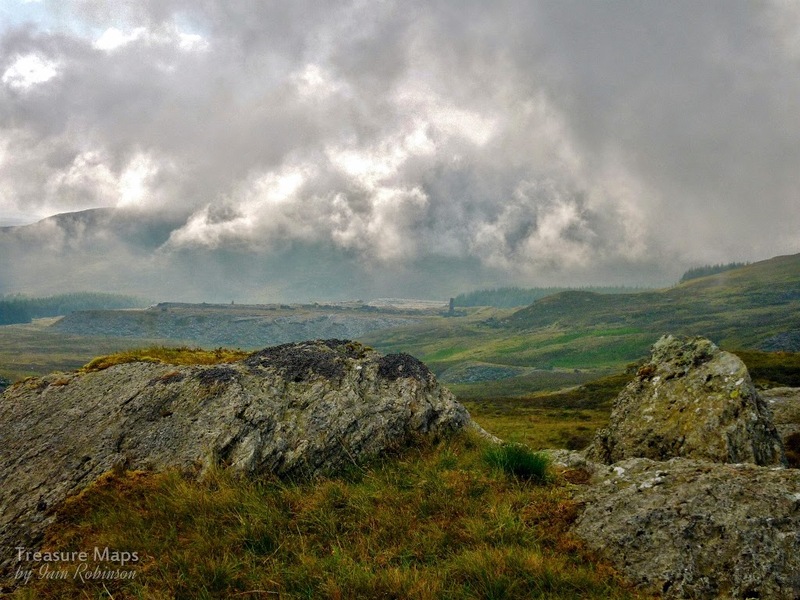 Rhiwbach is no exception; it is a remote site, spread over a wild corner of the moors between Cwm Penmachno and Blaenau Ffestiniog. 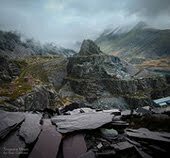 As most folk know, the quarry was served by a fascinating tramway which carried the finished slates down to the Ffestiniog railway and on to Porthmadog. Since the area is well above even the elevated position of Blaenau Ffestiniog, several inclined planes were involved. However, rather perversely, Rhiwbach and its near neighbour, Blaen-y-Cwm quarry were both situated below the tramway as it ran over the moor. Thus, they required inclines to lift their slate uphill for transport, rather than the norm, which was for slate to be run downwards. In the first days of the quarry at Rhiwbach, well before the tramway had even been considered, finished slate was sent by horse and cart down through Cwm Penmachno and then to Trefriw wharf for shipment. At least it was downhill all the way. However, wharfage charges and the sheer inconvenience of the distance to the River Conwy began to be an issue and so the quarry management began to look for a cheaper way to send the product to market. In 1820, a new road was built up Cwm Teigl from the south and a cart load of slate was taken down to the quay on the Afon Dwyryd at Trwyn y Garnedd. It is one of those mysteries that will never be satisfactorily cleared up, but although the trip was shorter and easier and the wharfage charges less, the journey was not repeated by the quarry for ten years. 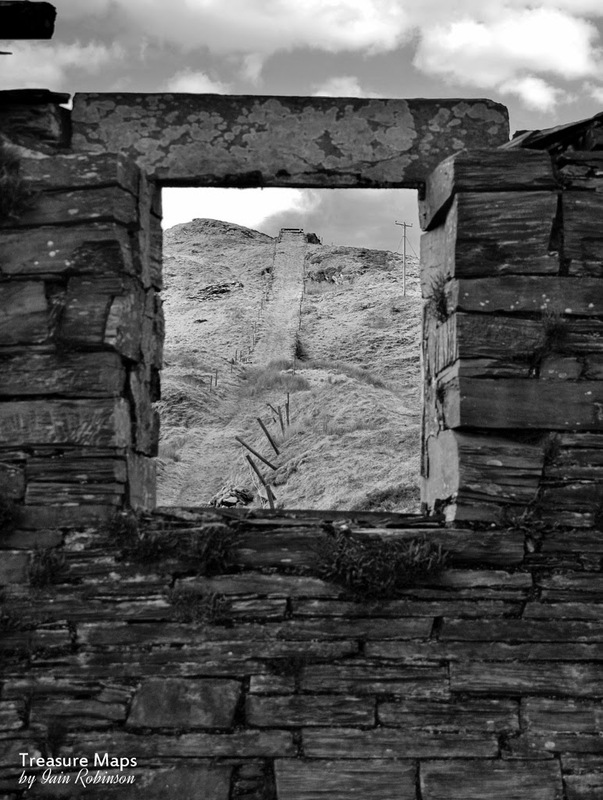 Slate continued to be sent to Trefriw until 1830. 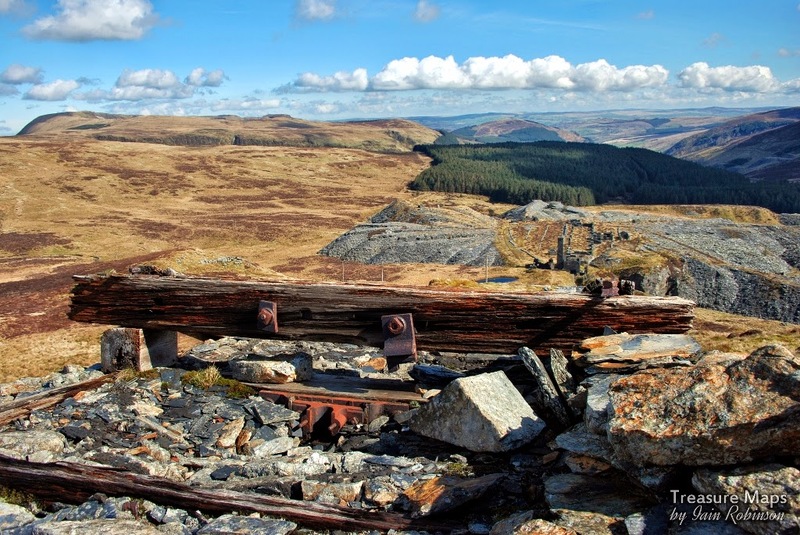 Eventually, in 1860 with the expansion of the quarry, Charles Spooner was asked to survey and design the tramway from Blaenau Ffestiniog to Rhiwbach. The contractor chosen was no less than Owen Gethin Jones, a celebrated local civil engineer, responsible for the railway bridge between Pont-y-Pant and Betws-y-Coed. Ironically, he was a slate mine owner himself, in a small way*. Looking down on Rhiwbach from the top of the incline sheave pillar. A horizontal wheel would have been set atop the pillar in the bearing below the beam. Today, the incline is an impressive feature, which rises up from the mill floor some 220 feet below, to the return sheave at the top. It is is 280 yards in length. 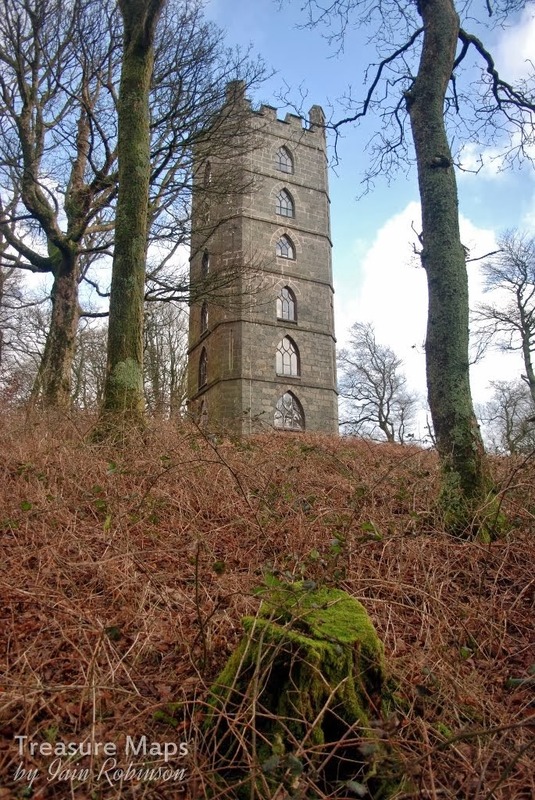 At first, it was proposed to build it as a water-balance incline, but no doubt Gethin Jones pointed out that the lack of plentiful water in the vicinity would make anything relying on copious water supplies a non-starter. Instead, he took the unusual step of building an engine house at the foot of the incline, with a cable that would run to the top on sheave guides and then return down in between the rails, being kept taut by a ballast waggon at the end of the cable. 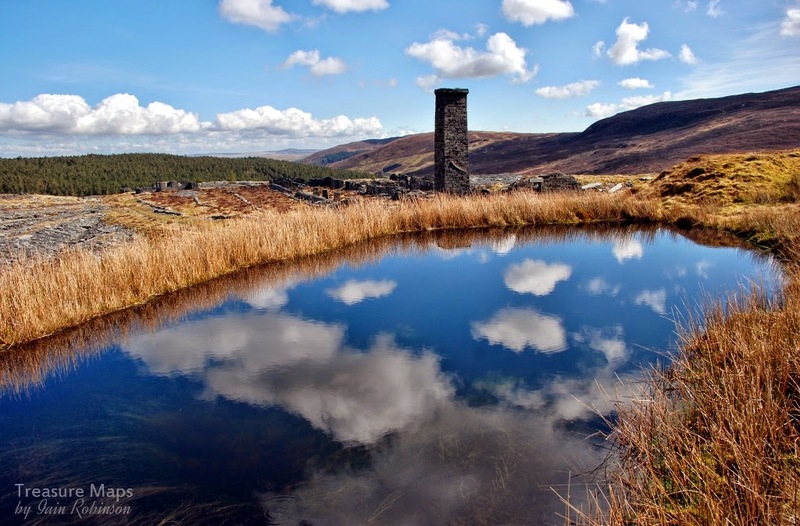 It is a tribute to the builders that the incline and the engine house chimney still stand today, despite the wild nature of the weather up on the moor. The Engine House Chimney and the incline from the mill level. While this arrangement is unusual in the area, neighbouring Blaen-y-Cwm quarry also used a similar incline system with a sheave pillar that can still be seen beside the tramway. Back at Rhiwbach, Jones oversaw the building of the engine house and incline. It was powered by a large and powerful, 20" single cylinder horizontal engine of four foot stroke, from the Haigh Foundry in Wigan. It was equipped, we are told, with link motion and reversing gear. Two, later three, six foot diameter winding drums were fitted, one to work the tramway incline, the other to bring slate up from the "New Mill" incline at a lower level. More significantly, the newer drum worked the incline from the Cwm End quarry, the underground workings opened out to the North. Only one incline could be worked at a time. The men, not surprisingly, dubbed the new machine "Injan Mawr" (Big Engine). Steam was supplied by two massive Cornish Boilers, 24 foot long and 5 feet six inches in diameter. All the machinery was hauled from the railway in Ffestiniog, up Cwm Teigl to the bwlch at Carreg-y-Fran. A journey that taxes empty slate trucks these days, let alone teams of horses pulling heavy machinery up a barely surfaced road. 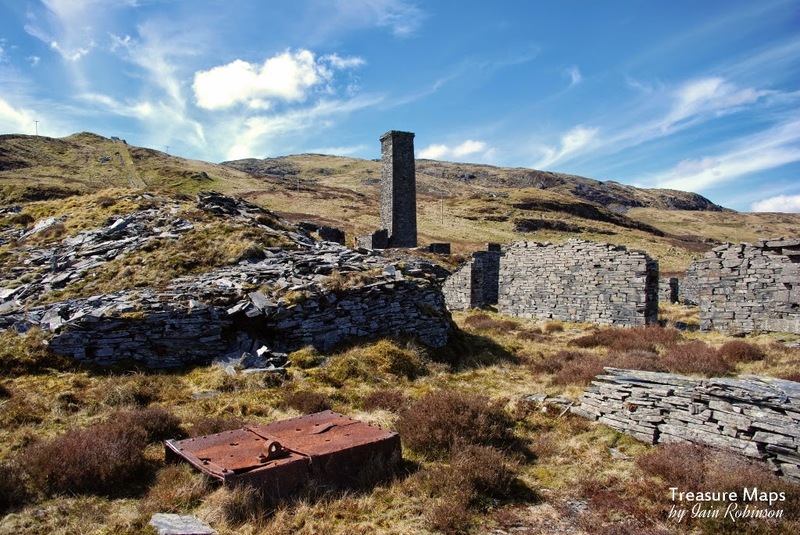 When the boilers were replaced in 1901 they came instead along the tramway and were designed to fit within the loading gauge at the rock cutting just south of the Cwt-y-Bugail quarry branch. A team of fitters had come from Lancashire to assemble the "Injan Mawr", but their embarrassment can be imagined when it was found that they were unable to make it work properly, although there was nothing intrinsically amiss with the machine. So, the quarry owners advertised for an engineer who could get the machine to do the work it was designed for. Soon, a man from the Wrexham area, John Jones, applied for the post. By all accounts, he quickly mastered the arcane ways of the machine "without loss or confusion" and was taken on the payroll with some alacrity by the management. He was apparently paid a substantial wage for his skills; most certainly a man who was in the right place at the right time. 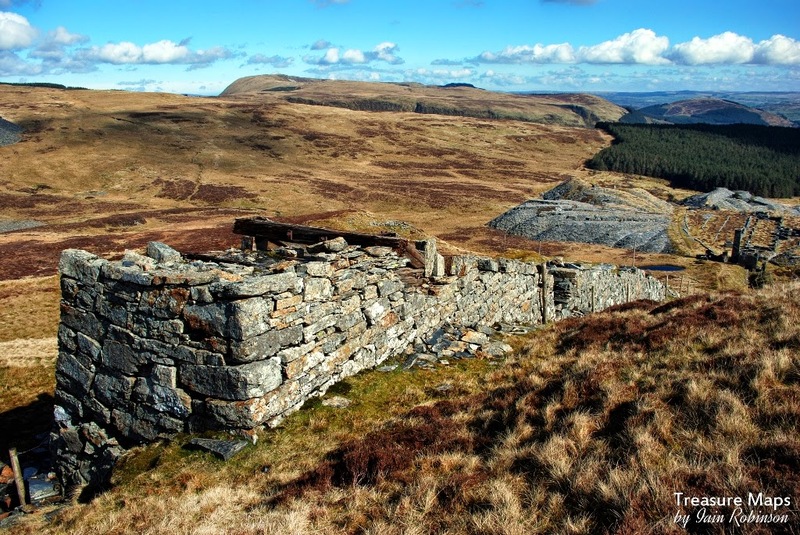 He later left to become manager at the nearby Bwlch-y-Slaters quarry. "The Railway Incline...where runs (of waggons) were very heavy, we needed to watch these, if the pressure dropped and failed to raise the load, it was serious for you. If you stopped on the way up...the engine's piston had a long stroke and you could not re-start the haulage, you had to lower it down to the bottom again." Raising a run was time-consuming. Firstly, three men would be sent up to the top to act as crewlers, to manage the loaded waggons as they reached the top. There is only a small level area before the sheave pillar itself and it was essential to unhook the waggons before they ran into the pillar. Waggons could only be raised two at a time, so a good run of waggons could take a couple of hours to get on to the tramway. Roberts recalled that he was paid £1.15s per week, but had to raise steam for the engine in his own time on Monday mornings. Slightly to the north of the engine house is a stone built winding house which was used to raise slate from a shaft to the three underground galleries of the Old Quarry. (The pit to the east of the incline). From documentary records, we know that at one time there were three drums attached to the engine, working the railway incline, the "new mill" incline at floor C and the Cwm End incline. 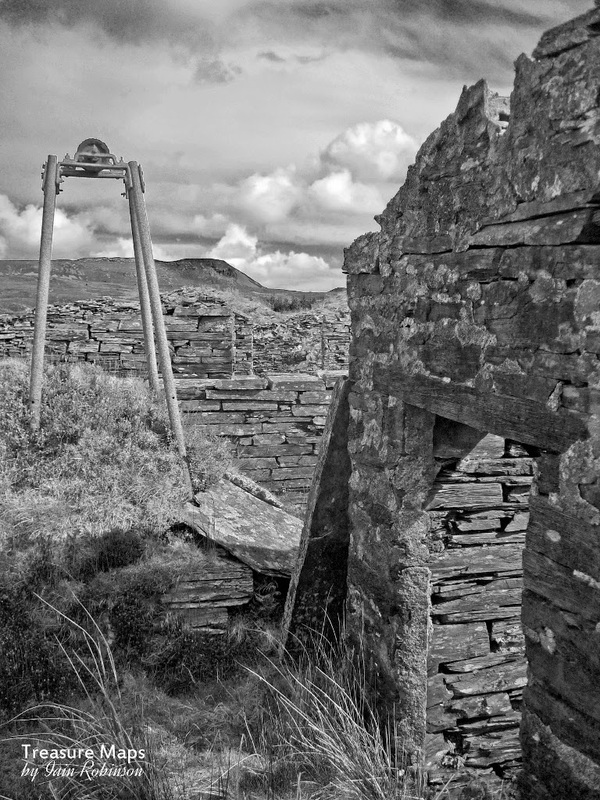 As working in the old quarry had probably been run down by 1860 when the engine house was built, it is unlikely that it was also used to work the headgear for the Old Quarry workings. Earlier, the lack of any significant surface water was mentioned- luckily, there was enough to fill a small catch pond slightly uphill from the engine house and this proved sufficient to supply the boilers. A pipe went from the pond to a cast-iron tank which ran the length of the east end of the boiler house. The mill and quarry went over to electricity in 1935, by which time the annual tonnage at the quarry was well below peak 1869 levels. Sadly, nothing is recorded about what happened to the Injan Mawr -presumably it was carted off for scrap along with all the other redundant steam machinery. 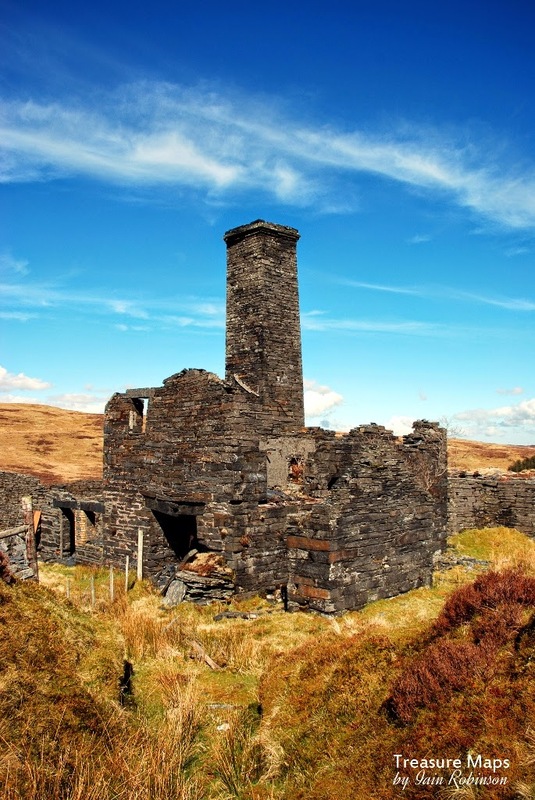 What a pity that it hadn't been left - along with the engine house and chimney it would have been a jewel in the crown of the windswept moors above Blaenau Ffestiniog. Link to the Haigh Foundry Wikipedia entry. Rather surprisingly, part of the original premises is still being used as a foundry, although on a smaller scale. Haigh were renowned engine builders in the C19th and built winding and pumping engines, notably a large Cornish pumping engine for Talacre Lead Mine, near Rhyl, with a 100" diameter steam cylinder in 1862. They also bid, unsuccessfully, for the manufacture of "Prince" for the Ffestiniog Railway. One of the sheave/guides alongside the incline which took the steel hawser wire to the top of the incline. 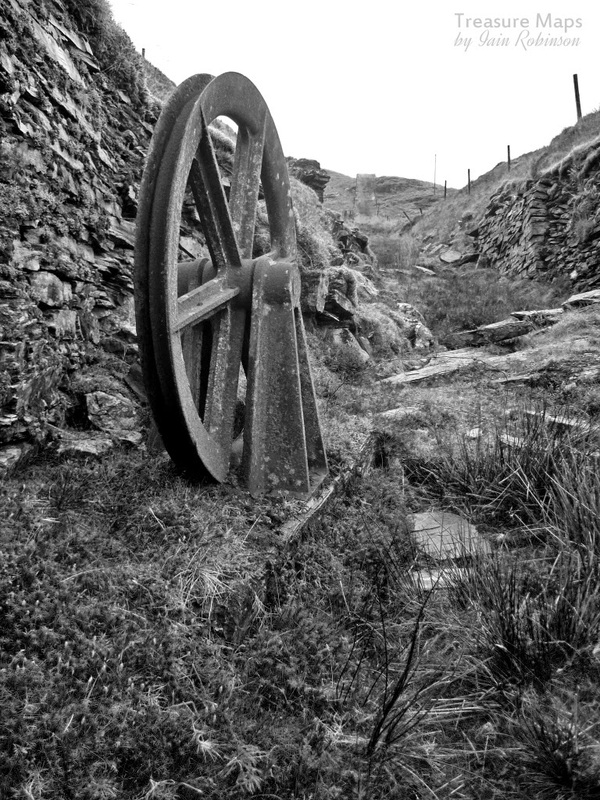 One of the supports for the Cwm End incline cable as it ran across the mill level from the Engine House to the incline in the north of the site. I shall have to add this one to my list! Thanks, Graham. It's a fabulous spot, even on a dreich day. You would love this whole area with the tramway, and the other quarries as well. Another fascinating post Iain: thanks for sharing it. I can just imagine the look on Gethin Jones' face when the managers assumed they could use a 'normal' incline to do the job they needed. I wonder how long it took to persuade them to install a winding engine? Glad you enjoyed it, Andy! Yes, by all accounts, Gethin Jones was not impressed. I think Spooner spread himself thinly over the ground as he was in so much demand during this period; he couldn't give his projects as much attention as he would have liked. He got a massive rap across the knuckles at Alexandria for not paying attention to the driving of the long tunnel, which cost the quarry company dearly.